Get set for monster madness as the worldwide truck sport phenomenon comes to your city. If you like watching motorsports then this is just the event for you. It's time to upsize your love for the genre as Feld Entertainment brings you the latest edition of Monster Jam. The Verizon Wireless Arena in Manchester, NH is the place to be if you want to catch these monster trucks in action. Legalized by the United States Hot Rod Association, Monster Jam has achieved global popularity in a relatively short span of time. Starting in 1972, the unique genre of motorsport has caught the imagination of fans all over the world. Although it was initially confined only to events within the country, now due to popular demand, Monster Jam events are held in Europe, Australia, Costa Rica, Mexico and the Philippines. Monster Jam events are popular with the fans as they give them with the opportunity to interact with the stars of the show. During the intermission session, titled the 'Pit Party,' fans are allowed to approach the trucks and interact with the drivers and their vehicles. Fans are able to take photographs, autographs or buy merchandise from their favorite superstars. Every Monster Jam event basically boils down to a test of skills and determination between the participants. The most common and popular competitions held involve variations of these two; the wheelie and the donut. If you are a fan of motorsport racing, then do not miss this opportunity; buy Monster Jam Manchester tickets now. 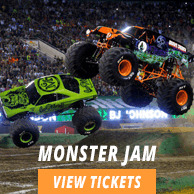 The average Monster Jam Manchester tickets at Manchester will cost you between $61 and $67, if you are looking for the cheapest seats then catch the event being held on 04/05/2019 for only $61. The average ticket will be at its highest of $67, on 04/05/2019. Minimum get in price is for Monster Jam Manchester tickets at Manchester is $26 for the event being held on 04/05/2019, there are certain dates that have a much higher get in price, for instance the cheapest seats on 05/05/2019, will set you back $33.